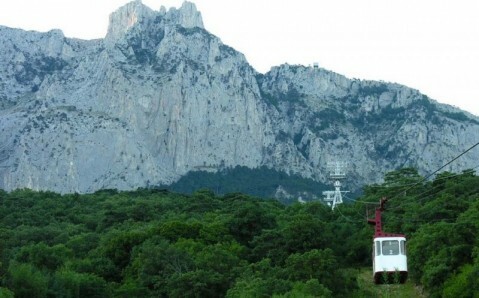 Working hours: Cableway: every day, upward bound station: 10 a.m. – 4 p.m.; downward bound station: 11 a.m. – 5 p.m.
Ai-Petri (Greek for ‘Saint Peter’) is one of the most famous Crimean mountaints. 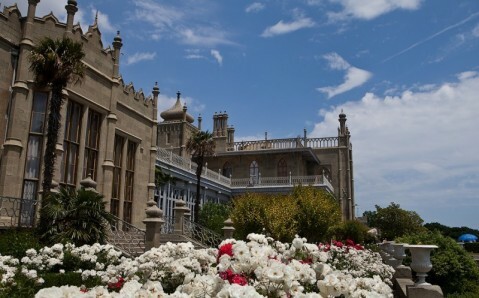 Its picturesque peaks, which fence off Yalta from the outer world, have become the symbol not just of the southern coast, but also of the entire Crimean peninsula. 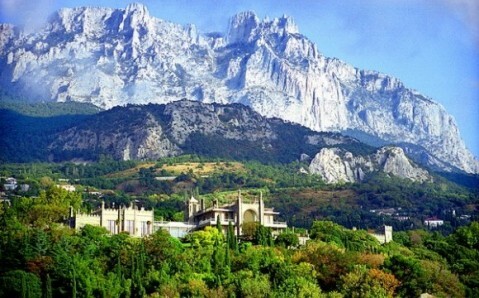 This legendary massif is attractive for tourists because from its peaks, one can get an amazing view over the whole southeastern coast of Crimea. 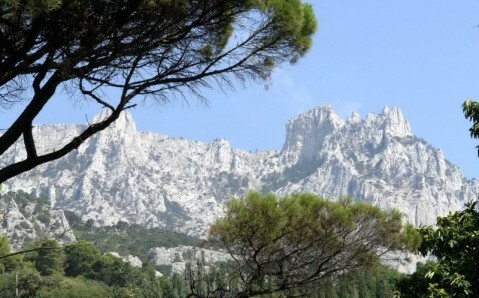 In order to see these fantastic panoramas, numerous travelers climb the Ai-Petri all year round. The best way to get to its 1200 meter (3937 feet) high peaks to see the unforgettable views is to use the cableway ‘Miskhor – Ai-Petri,’ which is an attraction itself. It consists of two parts, one of which is ‘unsupported’ and not like anything else in Europe. 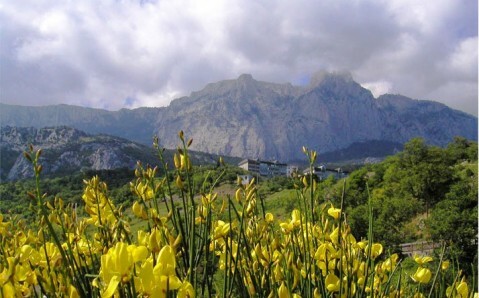 At the top of Ai-Petri, you expect to reach a bare stone plateau; instead, you come to a fairytale town. 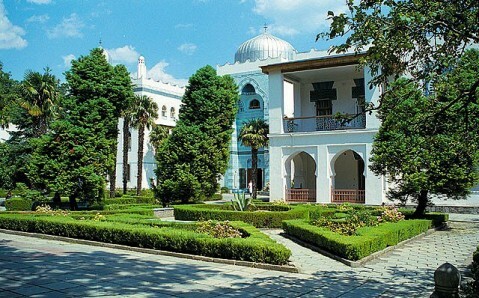 There are many cafes and places to try national Tatar cuisine, treat yourself to eastern sweets, and try the delicious Crimean wine. But still, when on Ai-Petri, most tourists hurry to Cliff Shishko, the observation point, from which one can get breathtaking views of the Black Sea coast. One more remarkable place on the top of Ai-Petri is the cave ‘Trehglazka.’ It is very peculiar, as its temperature hovers around zero degrees all year, and the floor of the cave is cover with several meters of ice. Ai-Petri also keeps a peculiar marker, a metallic globe on a granite base with its exact geo-location; all plateau visitors strive to touch it. 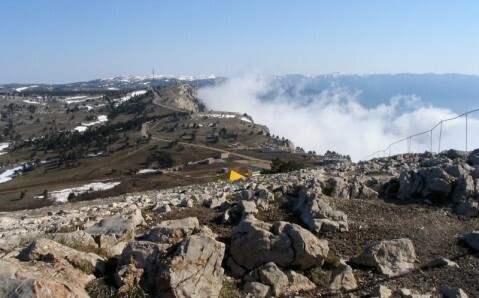 You can also get to the top of Ai-Petri by car, following the highway Yalta – Bakhchysarai. The road passes by the highest waterfall in Ukraine, Uchan-Su (‘Flying Water’). It is 100 meters (328 feet) high, which is twice as high as Niagara Falls. The waterfall is most spectacular during a storm or when the snow is melting. Ai-Petri has everything for an adventurous getaway. In the summer, you can ride horses, mountain bicycle, and jeeps, or paraglide here. And in winter, snowy slopes attract ski lovers and snowmobile racers. Getting here. 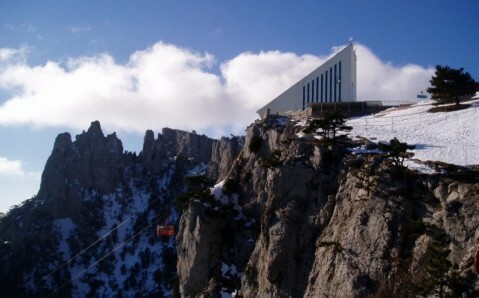 You can use the cableway ‘Miskhor – Ai-Petri’. 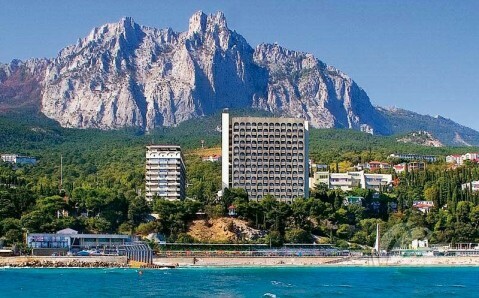 To get from Yalta to Miskhor, you can take bus №27 from Yalta’s transit station or bus №32 from the flea market.